I hope you didn't give up on me ever resurfacing! LIFE occurred, but I DID manage to use up scraps on this little 6-inch unit, called a Split 9-Patch, This is a busy photo - just look at the blocks in the foreground! I made half with red HSTs, and half with blue HSTs and just started attacking my 2 1/2 inch box of strips, using very lights and very darks. I had a LOT of dark blues, purples, etc. This little unit has an enormous variety of patterns, depending on how/where you place your colors. I kept the white on the HST as my constant. There are 96 units, 4 to a block and my plan was to make is 4 x 6 blocks, although one never knows until it's together! 4 x 6 blocks may look unbalanced -- maybe 5 x 5 would look better. Here they are with all darks at the 'center' or all lights at the 'center'. And here they are with the alternate dark/light placement, making a sort of heart in the center. 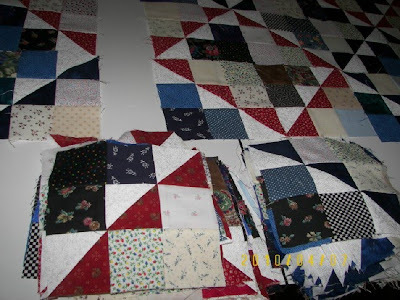 About the same time as I started mine, Bonnie at Quiltville.com showed a similar version and with her speed and energy, hers was done several weeks -- uhhhh MONTHS ago (see February 18, 2010 at HER blog)! 8-))) My gosh, I dIdn't want to be a copycat, but I am leaning towards copying her braided border -- I've never done one and it's really cute! Also, this happens to be our Guild BOM for April. My 2 1/2 inch box of strips DID finally close, but only barely. I'm still in Slow Mode with the crooked neck/pinched nerves. We tried to take a drive 2 weeks ago but had to return home after 60 miles - too much jouncing for me -- me who LOVES to drive! Arghhhhh! Glad that you are back blogging, and I love what you have been doing. 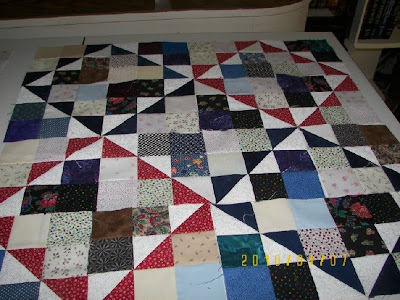 It is colorful and using up scraps is always a blessing! Missed you, Elaine! Love, love those blocks!! Very pretty...and continuing the prayers for that pinched nerve...your very last one! Gosh, maybe you need some sunshine to help loose up the muscles (at least). It doesn't sound like fun at all. The blocks are looking good. Very nice blocks Elaine- Hope that the neck is beginning to heal and that you are soon able to do the things that you enjoy doing. The blocks look good. I'm not sure which arrangement I like best. Hope your neck gets better soon. I have made split nine patches before. They are fun to play with trying to decide how to lay them out. I like the split 9 patch block and this one is wonderful! It is an awesome block..I am so thankful for Bonnie's ideas. Anxious to see all the blocks our guild prepares this month. I also feel slow in the sewing department, so busy with cattle..and a spring snow storm put a kink in plans. Feel Better soon..HUGS sew peacefully. Very interesting combinations, as always. Bonnie doesn't mind if you use her patterns as she shows them. This is look great. I do hope your pain goes away......it really wears you down doesn't it. I like your split nine patch blocks. Go for the braided border. Hope your neck will be better so you can do all the things you want to do. That's such a great block, and how different it looks as you play with the layout! I hope you're getting some needed treatment and seeking professional help for that distressing problem that keeps you from doing what you love. Take care! Prayed for healing in your body. I look forward to hearing that things are getting better!! The d9p look totally awesome!! I have done a few braided borders and I think it would look cool on this quilt. Interested in seeing how you are going to quilt it! This one would make a great Quilt Of Valor Elaine. I love them, they are wonderful. Yes....I am sooo liking the looks of this one!! Sorry about your neck/pinched nerves. I hope you are feeling better very soon. Love your split nine patches. Lots of possibilities with the setting. 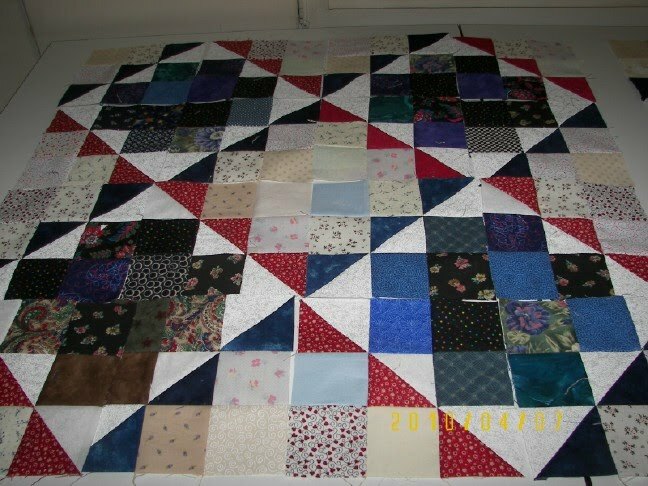 She basted ... She quilted!